Cigars On The Porch: Drywall...and More Tomatoes! Joe's been hard at work (like a mo-fo! 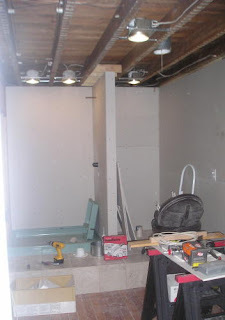 ), and this is starting to look like a freakin' bathroom, y'all! Even though I haven't been able to help much with the installation (other than hefting the big pieces up over outlets and such), I do admit to much help carrying those bastards from the shop, to the porch, through the front door, to the upstairs den, through the currently-not-a-wall wall, into the bathroom. Props to Joe for working long days at the office only to come home to long days with endless drywall. My only hope (and prayer) is for a functional bathroom come October. It doesn't need a ceiling. It doesn't need paint. It needs a working toilet and shower. IN A MAJOR WAY. On to other happy things...TOMATOES! 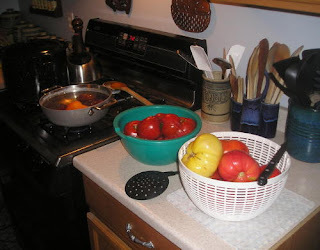 What you see here are tomatoes cooking (left), cooling (middle), and preparing to die (right). The majority of these toms are from LAST week - they lasted forever. I added a few weird ones (like the bazoomba yellow one on the right, as well as purples and greens) to make into sauce, because it just wasn't feasible that we'd eat them fresh anytime soon. I still have about 8 "sandwich type" tomatoes and a dozen golf-ball-sized ones ripening, and since we're having a wee block party this weekend, I thought I'd serve them then. I kid you not. Our freezer is full. Tomatoes are taking over our home. My mom just gave me several tomatoes from their garden. They had some "Boxcar Willie" tomatoes that were the size of a small cantaloupe! Massive! And they taste good. Heirlooms are the best. Bathroom is looking awesome. We've been wanting to update our master bath, and actually bought some gorgeous travertine tile, and that's as far as we've gotten! Sigh. This would be the part of a CSA that would be lost on me, since I have no taste at all for tomatoes. Let alone to be overrun with them!